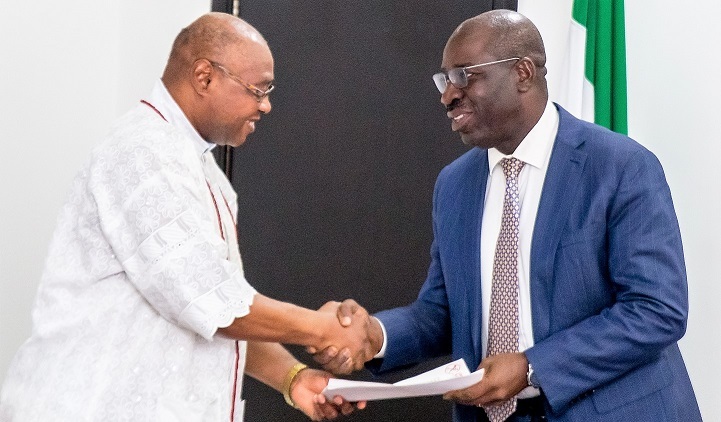 The Governor of Edo State, Mr. Godwin Obaseki, has reassured Edo people that a major focus of his administration is to expand the economy of the state and improve the socio-economic status of the people. Obaseki said this while receiving members of Great Benin Vanguard, who paid him a courtesy visit in Government House, Benin City. He added that his administration was also committed to consolidating on the political and social stability of the state. “As a governor, I have the responsibility to protect everybody who lives in Edo State and their properties,” he said, and appealed to the various ethnic groups in the state to give peace a chance for the overall progress and development of the state. He stressed that he would never be a party to any decision that will lead to anarchy or detrimental to the wellbeing of Edo people, who he swore to protect. He said his administration was laying the foundation for a greater Edo State and urged his guests not to be distracted by trivialities, noting that his government has been engaging stakeholders at various levels to ensure that there is harmony among the various ethnic groups in the state. The governor said one of such engagements was his recent trip to Bayelsa State where he had audience with Governor Seriake Dickson, of the state, over the issue. He noted that his Deputy, Comrade Philip Shaibu has equally been visiting some neighbouring states like Kogi and Ondo, where there are disputes and assured that those issues will soon be resolved in line with the provisions of the law. Earlier, chairman of the Great Benin Vanguard, Professor Ovenseri Aibueku, expressed displeasure over what he called an attempt to distort history by some people. Prof. Aibueku told the governor that some boundary communities in Benin Kingdom were under the threat of losing their lands and called on him to reinvigorate the state boundary commission to address the issue. He assured the governor of the continued support of the Benin Vanguard to the government of Edo State.